Make tax time less stressful! Easy-to-use software fills out tax forms quickly and is guaranteed to meet all IRS requirements. Easy to Use: Instructions included for installation and use. Allows multiple filers/payers and unlimited number of employees. Prints employee summary. Supports W-2, 1099 Misc., 1099 INT, 1099 DIV, 1099 R, 1099 S, W-3, 1096 forms and more. Allows multiple filers/payers and 10 Free filings (additional filings available for additional fees). 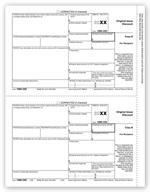 Works with both continuous and laser pre-printed tax forms. 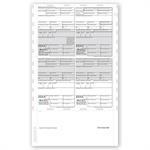 For printing on blank paper please order LaserLink product TF1203-4 here. Refunds are issued only on returns of unopened software packages. TF5110 2018 Laser 1099 Miscellaneous Income Federal Copy A 8 1/2 x 11"
TF5111 2018 Laser 1099 Miscellaneous Income Recipient Copy B 8 1/2 x 11"
TF5112 2018 Laser 1099 Miscellaneous Income Payer State Copy C 8 1/2 x 11"
TF5202 2018 Laser W-2 Employee Copy B 8 1/2 x 11"
TF5224 2018 4-up Laser W-2 Pressure Seal 8 1/2 x 14"
TF5164 2018 Laser 1099-OID Copy B 8 1/2 x 11"
TF5635 2018 Laser W-2 Set 6-Part Chase Premium 8 1/2 x 11"
TF5324 2018 Laser 1042-S Agent Copy E 8 1/2 X 11"
TF5110B 2018 Bulk Carton Federal Copy A Laser 1099 Miscellaneous Income 8 1/2 x 11"